Responsive and committed customer support, combined with technical expertise and in-depth industry knowledge, proved to be the winning formula for Gray Forklift Services, as we received the coveted Customer Focus Award at an international Awards event in Birmingham. 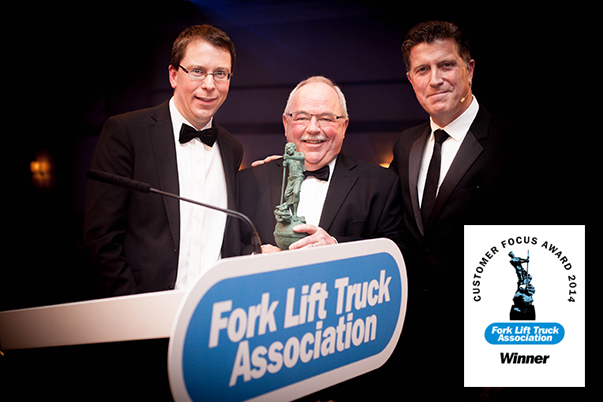 At the Fork Lift Truck Associations's Awards for Excellence ceremony, GFS achievements were recognised by the Fork Lift Truck Association Technical Committee. Excellent local customer support and reliable products, backed by global resources, proved to be the winning formula at the Mitsubishi Forklift Trucks Dealer Awards held at The Belfry, where Gray Forklift Services was awarded a Gold Award by the international manufacturer. Official Mitsubishi dealers for 20 years, Gray Forklift Services have held the Gold Award for Excellence, Dealer of the Year award for several years and most recently the Outstanding Achievement Award, proving, unequivocally that Gray Forklift Services is the forklift firm in the North East. Together with Mitsubishi, Gray Forklift Services pride themselves on their renowned service and outstanding customer care. The UKs Independent authority on forklift trucks. Members adhere to a strict Code of Practice and are vetted by the Association to ensure the highest standards are met. FPAL works to identify, qualify, evaluate, and monitor suppliers on behalf of its purchasing members in order to create an effective supply chain network.